Baby galaxies from the young Universe more than 12 billion years ago evolved faster than previously thought, shows new research from the Niels Bohr Institute. This means that already in the early history of the Universe, there was potential for planet formation and life. The research results have been published in the scientific journal, Monthly Notices of the Royal Astronomical Society Letters. for planet formation and life. For several thousand years after the Big Bang 13.7 billion years ago, the Universe consisted of a hot, dense primordial soup of gases and particles. But the Universe was expanding rapidly and the primordial soup became less dense and cooled. However, the primordial soup was not evenly distributed, but was denser in some areas than others. The density in some of the densest areas increased due to gravity and began to contract, forming the first stars and galaxies. This took place approximately 500 million years after the Big Bang. The earliest galaxies were probably comprised of primitive, giant stars that consisted of only hydrogen and helium. There were no heavier elements. They first appeared later in the evolution of the Universe, created by nuclear processes in the stars. A star is a giant ball of glowing gas that produces energy by fusing hydrogen and helium into heavier and heavier elements. When no more energy can be extracted the star dies and massive clouds of dust and gas are flung out into space. These large clouds are condensed and recycled into new stars in a gigantic cosmic cycle. The new stars that are formed will have a higher content of heavier elements than the previous and for each generation of star formation there are more and more of the heavy elements and metals. And heavy elements (especially carbon and oxygen) are necessary for the formation of planets and life, as we know it. Up until now, researchers thought that it had taken billions of years for stars to form and with that, galaxies with a high content of elements heavier than hydrogen and helium. But new research from the Niels Bohr Institute shows that this process went surprisingly quickly in some galaxies. 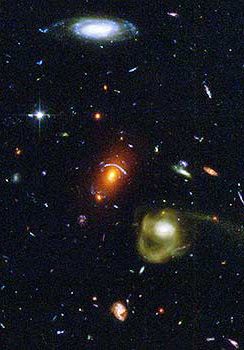 “We have studied 10 galaxies in the early Universe and analysed their light spectra. We are observing light from the galaxies that has been on a 10-12 billion year journey to Earth, so we see the galaxies as they were then. Our expectation was that they would be relatively primitive and poor in heavier elements, but we discovered somewhat to our surprise that the gas in some of the galaxies and thus the stars in them had a very high content of heavier elements. The gas was just as enriched as our own Sun,” explains Professor Johan Fynbo from the Dark Cosmology Centre at the Niels Bohr Institute, University of Copenhagen. The galaxies are so far away that you normally do not have the opportunity to observe them directly, but the researchers have used a special method. 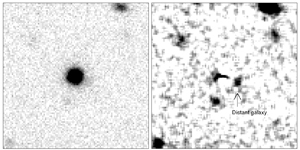 (NOT) of one of the quasars researchers have looked at. “There are some extreme objects in the Universe called quasars. Quasars are gigantic black holes that are active and when matter falls into them, they emit light that is as strong as thousands of galaxies. They are like a kind of lighthouse that lights up in the Universe and can be seen very far away,” explains Jens-Kristian Krogager, PhD student at the Dark Cosmology Centre at the Niels Bohr Institute, University Copenhagen. He explains that in order to use quasars as light sources the quasar must lie behind the galaxy you want to observe. “We then look at the light from the quasar and can see that some light is missing. The missing quasar light in the image has been absorbed by the chemical elements in the galaxy in front of it. By analysing the spectral lines we can see which elements there are and by measuring the strength of each line we can see the amount of the elements,” explains Jens-Kristian Krogager. They discovered not only that the galaxies from the very early Universe had a surprisingly large quantity of heavier elements, but also that one of the galaxies in particular was especially interesting. “For one of the galaxies, we observed the outer regions and here there was also a high element content. This suggests that large parts of the galaxy are enriched with a high content of heavier elements and that means that already in the early history of the Universe there was potential for planet formation and life,” says Johan Fynbo.